This product was added to our database on Thursday 15 November 2007. After the success of the original X-1 aircraft and the breaking of the Sound Barrier, both USAF and NACA decided to continue with the research into supersonic flight. 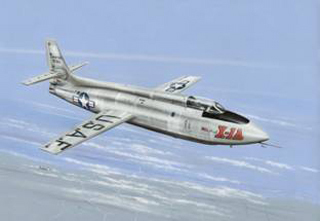 Therefore, they ordered the so-called "Second Generation" X-1 from the Bell aircraft company. These were three bigger aircraft, versions A, B, and D. They were used for high speed research (up to Mach 2.5) and high altitude flights with both good and bad results. The kit contains two sprues with grey plastic parts, injected canopy, resin and photo-etched parts. Decals are for one X-1D and four different X-1A – orange, 2 aircraft in natural metal surfaces and the last one in a white paint job.